Шестиместный легкий транспортный самолет Westland IV, разработанный в 1928 году, конструктивно представлял собой подкосный высокоплан, который вначале оснащался тремя рядными двигателями ADC Cirrus Mk III мощностью 95 л. с. Самолет был облетан 22 февраля ДальшеMore>>> 1929 года, вскоре за ним последовал второй самолет - с двигателями ADC Cirrus Hermes I мощностью 105 л. с. Затем началась сборка еще двух самолетов, но их оснастили звездообразными двигателями Armstrong Siddeley Genet Major I мощностью 105 л.с., после чего они получили обозначение Wessex. Затем под этот стандарт переоборудовали два Westland IV. Были построены еще шесть самолетов Wessex, причем у последних четырех машин обшивка передней части фюзеляжа была металлической, а двигатели Genet Major IA имели большую мощность. Один из них предназначался для компании «Portsmouth, Southsea and Isle of Wight Aviation» и отличался меньшим багажным отсеком, за счет чего удалось разместить на нем шесть пассажиров. Данные самолеты оказались весьма надежными, и большая их часть оставалась в эксплуатации многие годы, а последние два самолета, принадлежавшие «Air Pilots Training», были списаны в 1940 году Последние машины Wessex имели максимальную скорость 196 км/ч, а размах крыла составлял 17,53 м. IT is now several years ago that FLIGHT suggested the advisability of producing three-engined commercial aircraft of low or medium power for use on air routes on which the volume of traffic is not such as to warrant the operation of three-engined machines as powerful as those now carrying out the work on the London-Paris and the Cairo-Baghdad air routes. That, power for power, or pay load for pay load, the three-engined type is not as efficient as the single-engined machine has to be admitted. But there are circumstances under which forced landings have to be avoided, and the three-engined machine capable of flying on any two of its engines provides a fairly short cut to this goal. 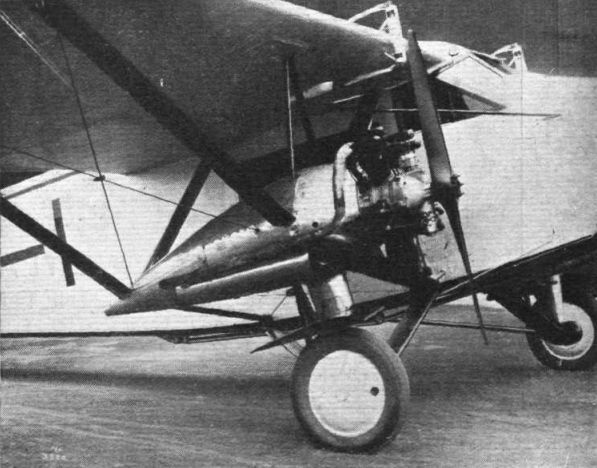 Whether, by sacrificing a certain amount of weight in the engine itself and in its installation, etc., a single-engined machine could not be produced with as great a freedom from forced landings as the present popular three-engined type is another story, into which this is not the place to enter. There are still those who remain unconvinced that the three-engined type has necessarily come to stay. In the meantime, Imperial Airways, who possess more operational data than any other body in this country, are, practically speaking, concentrating on this type, and that being so, it is to be expected that the three-engined machine will have a long run of popularity even if it should not be found to be the ultimate type. 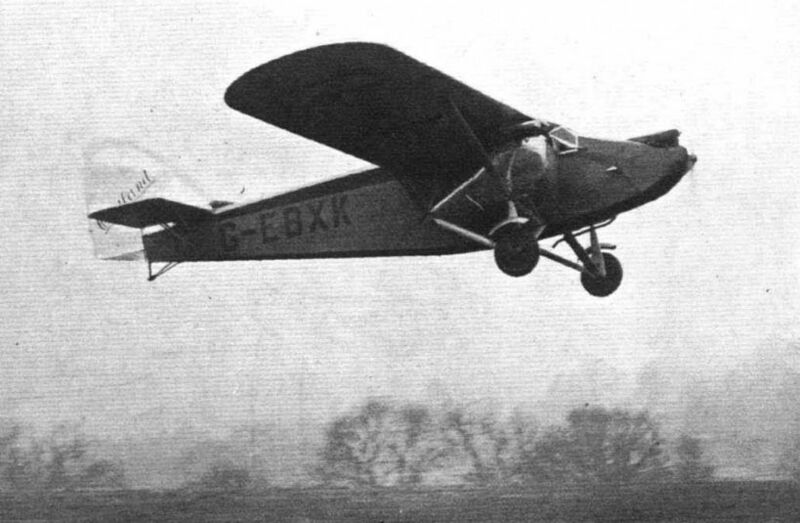 To the Westland Aircraft Works of Yeovil has fallen the honour of being the first British firm to produce a three-engined commercial aircraft of relatively low power. In fact, the Westland IV is probably the first machine of its power to incorporate the three-engined arrangement. The Handley Page "Hamlet," brought out some years ago, had three Bristol "Lucifer" engines of 120 h.p. each. The Westland IV has three "Cirrus III" engines of about 95 h.p. each (maximum). The Westland IV is a high-wing monoplane with strut bracing, two outboard engines, a fairly large fuselage giving comfortable cabin accommodation, and an undercarriage of very wide track to give good stability on the ground. Features of the design are the neat engine cowlings and the “clean” tapering nose of the fuselage. The three-engined type must necessarily have a higher drag than the single-engined, but in the Westland IV it would appear that very great care has been taken to reduce the extra drag as far as possible. The central engine is carefully mounted and cowled, and the lines of the nose of the fuselage merge into the wind-screen, cabin, and wing without very abrupt changes of direction. The outboard engines are neatly cowled, the inverted pyramid mountings lending themselves to the production of cowls of smooth outline and without sharp corners, and which trail off to a point at the rear. The wing section used is that known as R.A.F. 34, which has an almost stationary centre of pressure. The minimum profile drag coefficient is 0-0051 and occurs at a lift coefficient of about 0-1, both in British "absolute" units. The maximum lift coefficient is not high, about 0-51, at least according to model tests. There may, however, be a considerable scale effect, which may increase kl max. to 0-6. Based on model figures, and with a wing loading of 10 lbs./sq. ft., which represents full load, the stalling speed of the Westland IV should be 62 m.p.h. It is likely, however, that the full-scale lift will-reduce this somewhat, and the actual stalling speed is probably in the neighbourhood of 55 m.p.h. The total loaded weight of the machine is 4,900 lbs., and as the wing span is 57 ft. 6 in., the span loading, or W/span^2 is 1-485. Thus, at a take-off speed of 65 m.p.h., for instance, the horse-power required to overcome induced drag is only 37 T.HP. It would, therefore, seem that the wing arrangement chosen is a very efficient one. R.A.F. 34 section has a very good depth for spars, and its minimum profile drag is not much, if any, greater than that of R.A.F. 15. At a kl of 0-46 the profile drag coefficient is 0-008, so that the profile drag at 65 m.p.h. would be about 85 lbs., corresponding to a T.HP. of 15 or so, giving a total T.HP. required for wing drag of about 52. 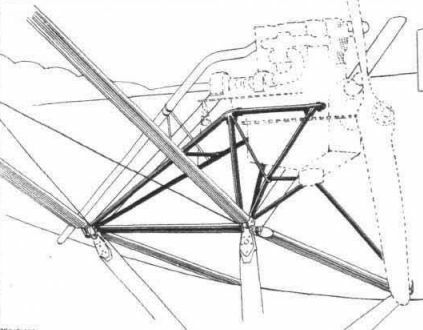 This figure does not include the drag of the wing-bracing struts, as it is a little difficult to decide how many feet of struts are properly wing struts and how many support the wing engines. At any rate, the wing drag at speeds slightly above stalling speed is very low, and the wing design must be regarded as an efficient one, apart from any practical advantages which the high-wing monoplane machine may have. The cabin of the Westland IV is very roomy and comfortable, and seating accommodation is provided for four passengers, of whom two face forward and two aft. In front, and on the port side, is the pilot's seat, and to the right of him is another seat, which may be occupied by an engineer, or, if desired, by another passenger. Windows in the sides of the saloon give an excellent view, while as regards the pilot the sloping wind screen affords a good view forward. 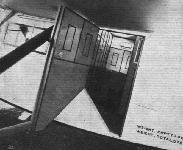 Aft of the cabin is the usual lavatory, the door arrangement of which is such that the lavatory space is made use of when entering and leaving the machine, but separated from the saloon when the machine is in flight. In the lavatory roof is an emergency exit. The saloon is entered through the aft door, and as the machine is quite low on the ground, passengers can step straight into the cabin by the use of very simple steps. Behind the saloon is a very large luggage compartment, and under the pilot's cockpit is another and smaller compartment for suitcases, &c.
The petrol tanks are housed in the wing, one of 48 gallons capacity on each side. From these two tanks the petrol flows by gravity to a common point, and thence to the outboard engines by gravity, and to the central engine by gravity, assisted by a windmill-driven petrol pump. In normal flying attitudes the "head" of petrol is sufficient to give gravity feed to the central engine also, but during a steep climb the pump is called upon to supplement gravity. On the first machine the undercarriage consists of two simple vees, one on each side, under the engine mountings, and springing is by rubber shock absorbers. The next machine will, however, have oleo "legs," and wheel brakes. The wheel track is very wide (14 ft. 6 in. ), and should give good stability on the ground. During preliminary test flights one of the wing engines was stopped several times, and it was found that up to altitudes of about 5,000 ft. the machine could be flown, and even climbed slowly, on the two other engines. As the "Cirrus" is in itself an extremely reliable engine, a machine with three of them and capable of flying on any two should be to all intents and purposes immune from forced landings. 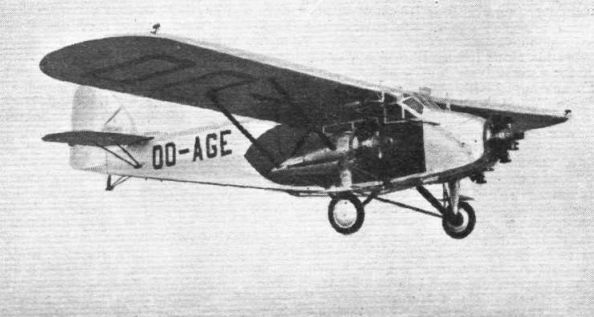 The first of the Westland IV limousine monoplanes has a tare weight of 3,145 lbs., and as its present C. of A. total gross weight is 4,900 lbs., the ratio of gross to tare weight is 1-58 to 1. With full tanks the cruising range is estimated to be 570 miles. The petrol (total capacity) would weigh approximately 700 lbs., so that, taking the weight of pilot as 160 lbs., and carrying no engineer, there would be available for pay load a capacity of about 895 lbs., which could be in the form of passengers or mails and goods. For shorter duration of flight, the pay load would, of course, be correspondingly increased. For instance, carrying 64 gallons of petrol, which would give a range of about 380 miles, and one pilot, the pay load would be approximately 1,120 lbs. Accurate performance figures have not yet been obtained, but the estimated cruising speed is about 95 m.p.h., and the estimated top speed 115 m.p.h. Assuming 90 b.h.p. as maximum power for the "Cirrus III," the power loading becomes 18-15 lb./h.p. The wing loading is 10 lb./sq. ft.
With passengers' seats removed, a certain amount would be saved on the tare weight, and in that case the machine should be a very useful mail carrier, especially for the conveyance of night mails, where the reliability of the three-engined arrangement should make for safety. The stripped cabin and luggage compartments would then, between them, give an available cargo or mail space of 193 cub. ft. It would probably not be difficult, if desired, to arrange for a small extra supply of petrol, when the machine should be capable of the flight London-Berlin non-stop. We would suggest that an experimental night mail service between these two centres would be very well worth while. 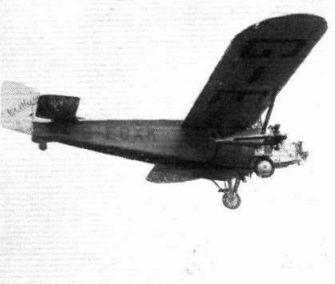 For use in the dominions, the Westland IV should be an extremely serviceable type, and in this connection it might be pointed out that the machine could be fitted with floats and used as a seaplane. Presumably, it would also be quite feasible to fit it with a ski undercarriage for use in countries like Canada. THE Westland Aircraft Works, which are a branch of Petters, Ltd., will be represented at Olympia by three complete aircraft and one "Wapiti" fuselage, shown in skeleton. The three machines will be: One "Wapiti" General Purpose two-seater, with Bristol Series VIII engine, one "Westland IV" three-engined limousine, with three "Hermes" engines, and one "Widgeon" Mark IIIA light monoplane with "Cirrus" Mark III engine. The second complete machine to be shown on the Westland stand will be a three-engined monoplane limousine. Known as the "Westland IV," this will differ slightly from the first machine of this type, which was first produced and tested a few months ago. The main changes will relate to the power plant, which in the show machine will be three "Hermes" engines instead of the three "Cirrus III" engines fitted in the first machine. 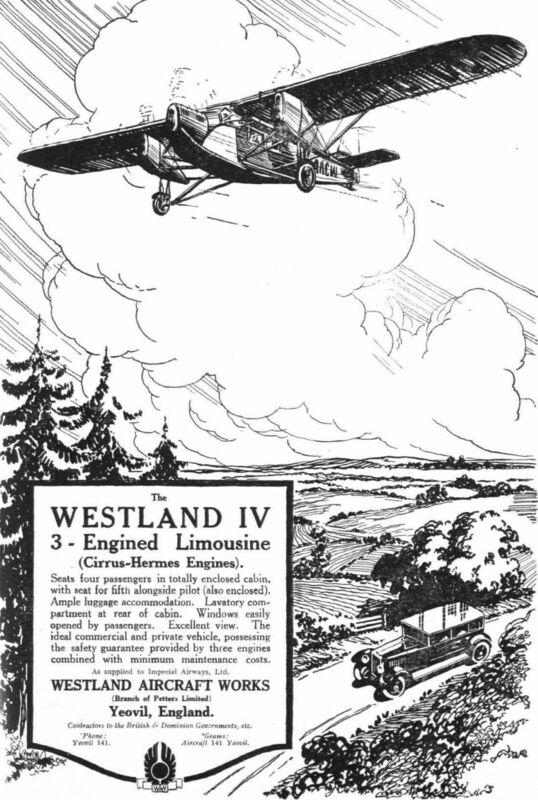 The "Westland IV" limousine is intended for use on "feeder lines" to the great trunk air routes, and as a machine for private charter and taxi work, where the freedom from forced landings given by the three-engined power plant arrangement is desired. It has seating accommodation for four passengers, a pilot and an engineer. Arranged for conduite interieure, the "Westland IV" has pilot and engineer placed in a cockpit with large windscreens ahead of the monoplane wing, the passengers' saloon being under the wing and behind the cockpit. The saloon is entered through a door on the port side, and as the machine is very low over the ground, no steps are required. The three engines are arranged in the usual way with one in the nose and two outboard under the wing, but the mounting of the wing engines is unusual in that these engines are not carried by the wing direct but on outriggers from the fuselage. The "Hermes" engines are almost totally cowled-in, and long exhaust pipes are fitted, terminating in "fishtails," which have been found greatly to reduce the noise of the exhaust without, apparently, reducing the power of the engines. Constructionally the "Westland IV" is of composite type, the main planes and front portion of the fuselage being of wood construction, while the rear portion of the fuselage is of metal construction, as are also the elevators, ailerons and rudder. A wide-track undercarriage is fitted under the outboard engines and incorporates oleo legs. The normal petrol capacity is 96 gallons, giving a range of 525 miles. The tare weight of the "Westland IV" is 3,150 lbs., and the weight of the aircraft with crew and the amount of fuel specified above is 4,260 lbs. As the gross weight is 5,500 lbs., this leaves a total paying load, for a range of 525 miles, of 1,240 lbs. The wing loading is 11-2 lbs./sq. ft. and the power loading (at normal r.p.m.) 17-45 lbs./h.p. The full speed at ground level is 120 m.p.h. and the cruising speed 100 m.p.h. The service ceiling is 12,000 ft. and the absolute ceiling 14,000 ft. With one of the three engines stopped the absolute ceiling is 6,000 ft. Rate of climb at ground level is 640 ft./min., and with one engine stopped 220 ft./min. It is interesting to note that with only one engine running the gradient of descent is 1 in 38 at 5,000 ft., so that even under these conditions the machine should in most cases be able to reach a field where a safe landing could be made. MAKING its first bow to the general public at the Olympia Aero Show in July, the Westland IV has since undergone slight modifications without, however, losing the distinctive appearance of the prototype. The main changes are :- The mudguards over the wheels are now made of streamline section so as to reduce drag. The complete oleo leg and torque rod is now encased in a streamline fairing or "trousers." The fairing under the fuselage has been removed, exposing the rod controls to the tail surfaces and thus facilitating inspection and maintenance. The cowling of the three "Cirrus-Hermes" engines has been altered so as to reduce engine drag, and in future the nacelles will be made a little narrower and of better streamline form. The improved design has been found to reduce the drag appreciably. Push and pull rods are used throughout the machine. All control bearing surfaces are made extra large to reduce wear as much as possible. Large boiler-type petrol gauges are fitted on the leading edge of the main plane, where they are in full view of the pilot. A mirror facing aft is fitted conveniently above the front of the pilot's cabin so that the pilot can observe the movements of the rudder and elevator. When fitted with three "Cirrus-Hermes" engines, the main data relating to the "Westland IV" are as follows: length, 37 ft. 6 in. ; span, 57 ft. 6 in. ; wing chord, 9 ft. 6 in. ; wing area, 490 sq. 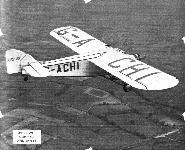 ft.; wheel track, 15 ft.; volume of cabin, 108 cub. ft.; volume of luggage lockers, 42 cub. ft.; tare weight (goods machine), 3,550 lbs. ; tare weight (passenger machine), 3,642 lbs. ; weight of fuel and oil (full capacity), 830 lbs. ; weight of fuel and oil (two-thirds capacity), 570 lbs. ; pay load as goods machine, 1,190 lbs. ; pay load as passenger machine, 1,098 lbs. ; gross weight, 5,750 lbs. ; wing loading, 11-7 lbs./sq. ft.; power loading, 18-3 lbs./b.h.p. Maximum speed near ground, 110 m.p.h. ; cruising speed near ground, 95 m.p.h. Duration and range (full fuel capacity), 5 1/2 hours, 520 miles; duration and range with two-thirds fuel, 3 3/4 hours, 350 miles. Rate of climb at ground level, 530 ft./min. Service ceiling, 10,000 ft. Maximum height maintained on two engines, 2,000 ft. In addition to its use as a passenger or goods-carrier, the "Westland IV" is regarded as being specially suitable for photographic air survey work. 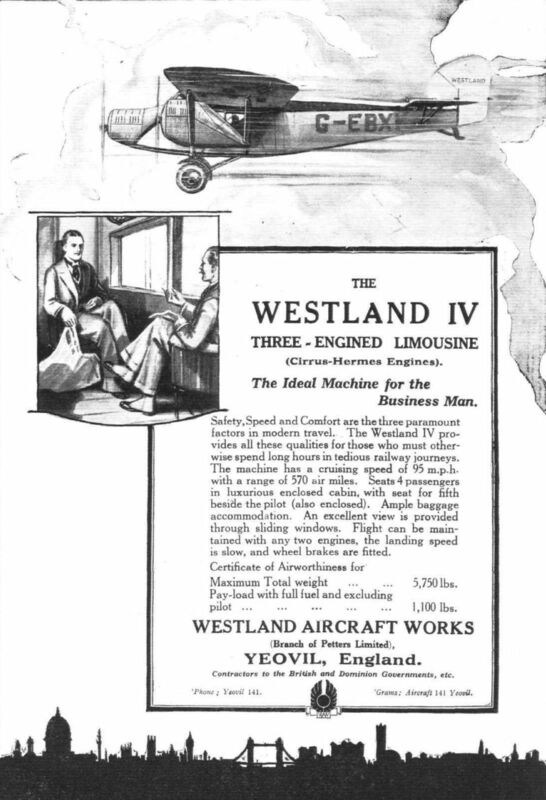 AMONG the pioneers of British producers of commercial aircraft may well be classed the Westland Aircraft Works of Yeovil. Already as long ago at 1919, that firm produced a little four-seater limousine biplane with Rolls-Royce "Falcon'' engine, although the fact may have been forgotten by many of our readers by now. While engaged mainly on the production of service aircraft, of which many notable types have been turned out - the latest and by far the most popular being the "Wapiti," of which we believe more than 300 have been built - Westlands have ever kept an eye on the progress of civil aviation and its requirements, and Mr. Bruce, Westland's managing director, is a firm believer in the great future of civil aviation. It may be recollected that several years ago Westlands produced the "Widgeon" two-seater light monoplane. Owing to the large volume of work in hand - on service types of aircraft - it was decided not to go into mass production with the "Widgeon," although the machine was very successful. But work was begun on another type, of the "feeder line" class, which was ultimately produced late in 1928 and flown early in 1929. This type was known as the Westland IV, and with it a considerable amount of experimental research work was carried out. 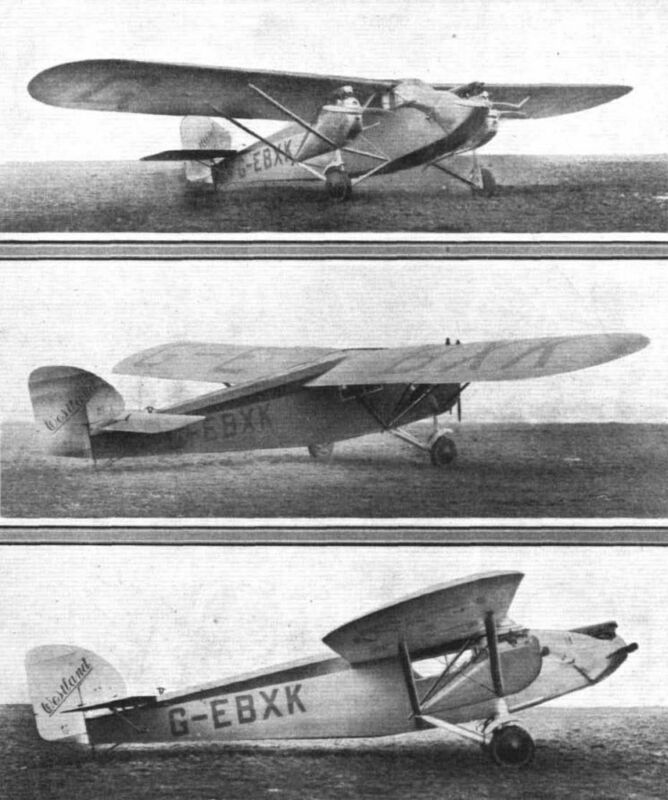 The "Wessex," which forms the subject of this article, is the outcome of the experience gained with the Westland IV, and in it such "teething troubles" as were met with in the earlier machine have been entirely eliminated, so that the "Wessex" can be offered to the aircraft operator as a well-tried and really practical machine, suitable for "feeder line" work, as a passenger or goods carrier, as an air mail machine, as a taxiplane, or as a private machine for the owner who desires something a little more ambitious than the more usual 2- or 3-seater. 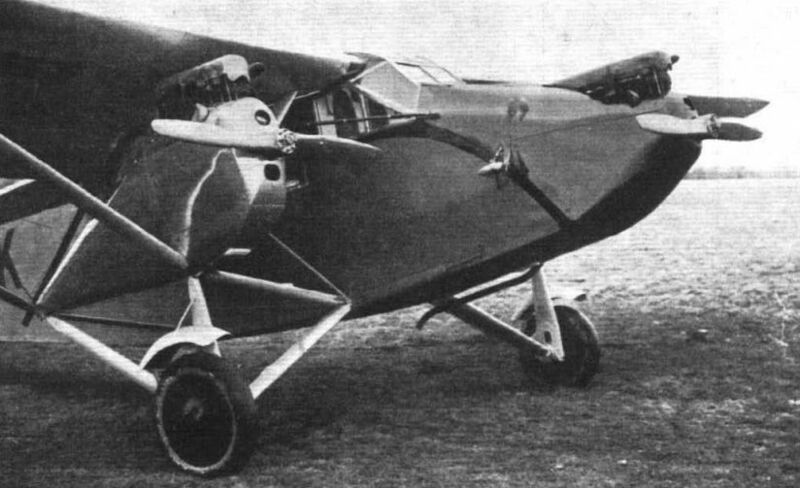 The Westland "Wessex," fitted with three Armstrong Siddeley "Genet Major" engines, is a "two-and-a-half tonner," i.e., its gross weight is 5,750 lb. As a goods machine the tare weight is 3,500 lb., so that the disposable load is 2,250 lb. This represents a ratio of gross to tare weight of 1-643, or, in other words, the machine carries as load 64 per cent, of its tare weight. For a three-engined monoplane type of machine, this must be regarded as a good figure, and points to considerable care and skill in the structural design, especially as it is combined with wing and power loadings which cannot be regarded as other than very moderate (wing loading 11-7 lb./sq. 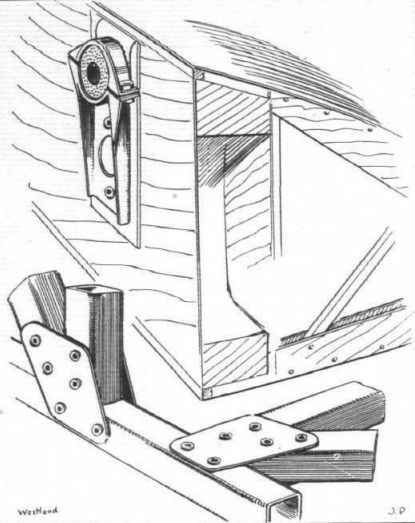 ft. Power loading 18-6 lb./h.p.). Looked at in another way, the disposable load represents 7 1/3 lb. per h.p., the possibility obviously existing for dividing this disposable load in any ratio desired for the particular purpose for which the user intends to employ the machine. As actually built (a number of "Wessex" machines have been delivered to the Belgian S.A.B.E.N.A. Company), the "Wessex" has petrol capacity for 5 1/2 hours, representing a still-air range of 520 miles. With that range, and if used as a goods machine, the pay load (i.e., load exclusive of fuel, oil and pilot) is 1200 lb., or 3-9 lb./h.p., based on normal full power. If less petrol is carried, the pay load is, of course, correspondingly increased. For example, with the tanks two-thirds full, the range is reduced to 350 miles, and the pay load is increased to 1,488 lb., or 4-8 lb./h.p. Thus, the "Wessex” should be quite an economical machine to operate as a goods or mail carrier, although for the latter purpose its cruising speed (95 m.p.h.) might be a little low, except possibly for a night air mail service, for which purpose the three-engined power plant arrangement and ability to fly on any two engine give sufficient reliability. The subject of pay load and range is closely up with that of performance, and in the Westland "Wessex " a very useful compromise has been made between these mutually opposed desiderata. We have already indicated that the disposable load is good for a machine of this type. By choosing a suitable combination of wing and power loadings, the Westland designers have achieved a performance which represents a good compromise between climb, speed and small power requirements at cruising speed. The power loading, owing to the considerable useful load carried, is fairly high (18-6 lb./h.p. ), and it is an axiom among British aircraft designers that one may have a high wing loading or a high power loading, but that one should not have both. The application of that fundamental principle has resulted in British aircraft always being far from what the French in the old days of flying used to call tangent, i.e., near the point where the power required and power available curves touch each other. In the "Wessex" the wing loading has been kept down to 11-7 lb./sq. ft., a figure which, especially with a monoplane, gives not only a reasonably low landing speed, but also, in conjunction with fairly low span loading, a fairly small value of induced drag and consequent good take-off and climb. In the general design of the Westland "Wessex" there are, perhaps, two features which particularly distinguish this machine from others of the same class: the mounting of the outboard engines on outriggers from the fuselage, bracing the wings from the apices of the outriggers, and the placing of the engines in such a way that not only do the propeller discs not overlap, but the tips of the outboard propellers are actually below the level of the wings, so that the slipstream does not, except possibly to a very limited extent, interfere with the airflow across the wing. The wing section employed in the "Wessex" is that known as R.A.F. 34, which has a very small movement of the centre of pressure. It is claimed that this fact, coupled with the high-wing monoplane arrangement, renders the machine very stable at all speeds, and controllable near and even beyond the stall. Purchasers who so desire may, presumably, have Handley Page automatic slots fitted at extra cost. The internal lay-out of the ''Wessex" will naturally depend upon the purpose for which the machine is being used. As a freight-carrier the cabin equipment will be removed, and all the available space used for freight. The cubic capacity of the main cabin is 108 cu. ft. (3-06 m.3), while the entrance and lavatory space adds another 35 cu. ft. (0-99 m.3). The volume of front and rear luggage compartments is 42 cu. ft. (1-19 m.3), giving a total available space for cargo of 185 cu. ft.
As a passenger machine the "Wessex" can be arranged according to requirements. For example, if the maximum comfort and convenience is wanted, there are four seats in the cabin, two on each side, with a gangway between them. In that case there is an entrance and lavatory behind the cabin. On the other hand, .the available space may be utilised by doing away with the entrance and lavatory space, when two more seats may be installed, bringing the total up to seven (six in the cabin and one beside the pilot). The passenger version has very comfortable seats, and large windows in the cabin walls give a good light and view. Owing to the fact that the fuselage is very low over the ground, the passengers can step straight in without using steps. Behind the cabin is a luggage space with a separate door. The pilot's cockpit, in front of the cabin, is weatherproof, and has a hinged skylight which also serves as an emergency exit in case of accident. Sliding Triplex windows form a windscreen, and sliding windows at the side of the cockpit give a good view, while the fact that they can be opened enables the pilot to put his head outside during landing, etc. Considerable care and attention has been given to the lay-out of the cockpit, placing of instruments and controls, etc. The instrument board is placed at a convenient height and at an angle which facilitates the reading of the instruments. The placing of the instrument board under the large front windscreen gives good lighting. 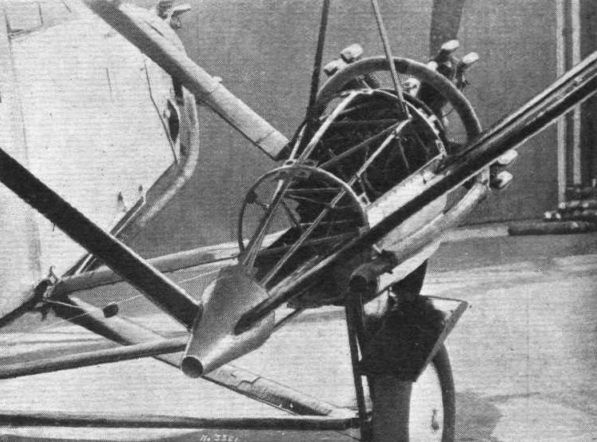 On the left of the pilot are the three engine controls, the tail-plane trimming-gear lever, and the wheel brake lever. On the pilot's right is the rudder bias lever, which enables him to set his rudder to any desired angle to counteract any yawing tendency resulting from one of the wing engines running badly or being out of action. This rudder bias gear removes the load from the foot bar and relieves the pilot on a long flight. With everything properly adjusted the "Wessex" will, we are informed, fly itself for long periods. The "Wessex" is particularly well equipped in the matter of instruments. For example, the following instruments (Smith's) are provided as standard: air-speed indicator, altimeter, cross level, time-of-flight clock, three revolution indicators, three oil-pressure gauges, three oil-temperature gauges. The compass fitted is a Hughes Mark P.4 and every machine is also provided with Schilovsky-Cooke turn indicator. At extra cost the machine can be provided with night-flying equipment, consisting of navigation lights, Holt flares, and downward identification lamp. In the cabin are mounted, for the benefit of the passengers, an airspeed indicator, an altimeter, and a clock. All the main data relating to the Westland "Wessex" are given in the panel on p. 1082. The performance figures given are confirmed by official Air Ministry tests at Martlesham for the Certificate of Airworthiness. The results refer to standard atmospheric conditions. Where climatic conditions differ materially from standard, the Westland Aircraft Works should be consulted as to the likely effect on performance. We are not aware that the Westland "Wessex" has hitherto been "put on floats," but it would appear that to do so should not be a very difficult matter. 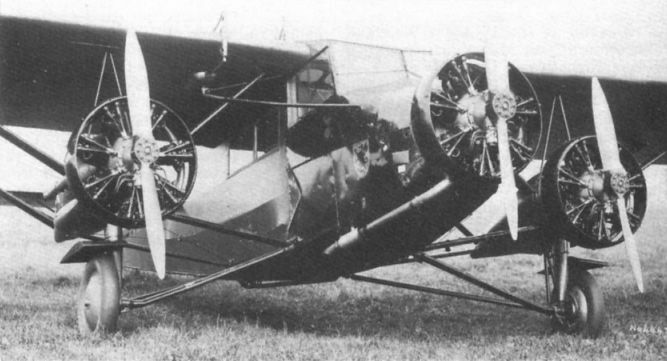 The struts supporting the floats might have to be rather longer than the telescopic legs of the wheel undercarriage so as to get the nose propeller clear of the spray from the floats, but otherwise, except for a possible strengthening of the rear outriggers, it would appear that no great modifications would be required. The machine, with its wide track and placing of the wing engines, should make a very useful seaplane, the wide track, giving stability on the water, and the outboard engines giving great manoeuvrability. In many parts of the Empire a seaplane of this type should be a very serviceable machine. WESTLAND AIRCRAFT WORKS have altered their well-known three-engined "Wessex" (three seven-cylinder "Genets") to carry eight persons, including the pilot, and this, the latest, version was described in FLIGHT for September 14. A few days ago we had the pleasure of a flight in this model, and found that the added accommodation has in no way spoilt the comfort or general attractiveness for operators who want a machine entirely suitable for really hard commercial work on feeder lines or on scheduled ferry services like that run by the Portsmouth, Southsea & Isle of Wight Aviation Co., Ltd., between Portsmouth and Ryde and Shoreham-by-Sea. In fact, for most uses the extra accommodation will undoubtedly enhance the value of the "Wessex" considerably. Imperial Airways have nothing but praise for the "Wessex," which they have had for some considerable time and which they use for charter work all over the world. It is probably one of the hardest worked aeroplanes in their fleet, but nevertheless their upkeep costs have been almost negligible. It is its robust construction which immediately attracts anyone with engineering knowledge who looks at this machine. After all, freedom from upkeep costs is one of the most important desiderata to the operator, and this point of view has been kept to the fore by those responsible for the "Wessex." The latest version has a few differences when compared with the older models. The wing struts are now made from streamline steel tube instead of round tubes faired with wood. Shaped mudguards have been fitted to replace the flat shields used previously, and the undercarriage has been widened in order to give a larger wheel track and better to carry the increased load. This has also been allowed for by fitting larger wheels. The model we were able to inspect and photograph had been sent up somewhat hurriedly for inspection, and the Townend ring-type engine cowlings had not been fitted. In the pilot's cockpit there is immediate evidence of care and thought for the pilot's comfort. The windscreen on the left-hand side is divided and so arranged that the lower half can be opened outwards to a greater extent than the top half. This deflects the draught clear of the intervening gap while at the same time giving the pilot a space to look through between the two halves. In bad weather this is an excellent feature. The roof of the cabin, which is lighted with cellon panels, hinges up as a whole, and the latest model will have a small panel above the pilot which he will be able to open and put his head through in order to assure himself that no aeroplane is landing over him when he himself is about to take off. The main cabin is well upholstered with very comfortable seats, having adjustable head rests, and has a generous equipment of hat racks and other convenient accessories. There are instruments on the forward bulkhead, so that the passengers can see what is happening, and the door between them and the pilot has a large window in the upper half for communication purposes when it is not desired to open the whole door. From the performance point of view we do not think that any great difference will be found between this and the earlier model. We were not able to try the machine ourselves, but were able to see that for normal purposes, the performance on any two engines is admirable. We understand that height can be maintained at 5,000 ft. with full load under these circumstances. 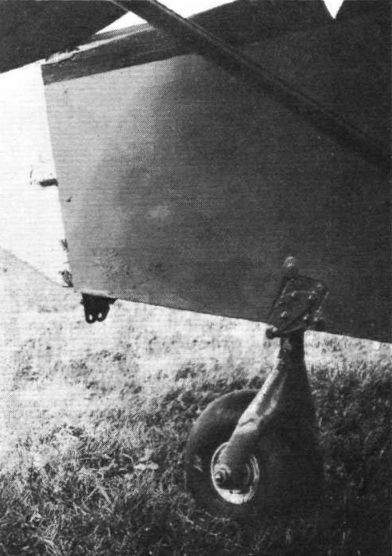 The Westland patent rudder bias relieves the pilot of all trouble should he have to fly on two engines, and both this and the tail trimming gear appeared adequately sensitive. A well-fitted lavatory and luggage space are aft of the cabin. THE WESTLAND IV: This photograph shows the engines, undercarriage and cockpit windscreen. Note the streamline engine housing and wide wheel track. WESTLAND LIMOUSINE (3 A.D.C. "Hermes"). Westland IV имел экипаж из двух человек, размещавшийся в закрытой кабине, а четыре пассажира находились в отдельной кабине. 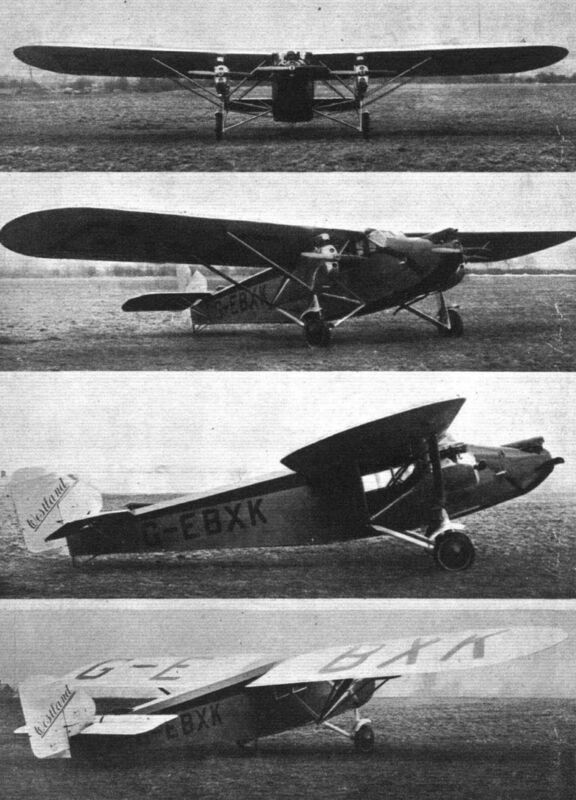 THE WESTLAND IV COMMERCIAL MONOPLANE: These four views show the new Westland monoplane with three "Cirrus III" engines. The machine carries six occupants in a comfortable saloon. 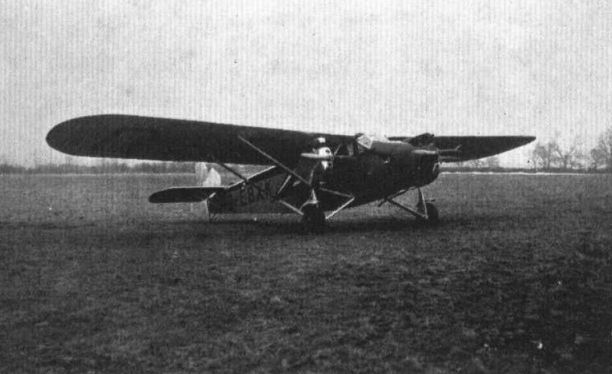 The prototype Westland IV with Cirrus III engines. The Westland IV monoplane (3 "Cirrus III" engines) in flight. FLYING VISITORS OF INSPECTION: On the occasion of the demonstration of the new "Cirrus-Hermes" engine at Croydon last week, several light 'planes were flown to Croydon so that their owners could inspect it. Our picture shows the Westland "Limousine" (3 "Cirrus III"), piloted by Capt. Paget, which machine will shortly befitted with "Cirrus Hermes" engines. A VISITOR FROM THE NEAR EAST: His Excellency Sheikh Hafidh Wahba - a Delegate from Hejas to the recent Postal Congress - visited the Works of Petters, Ltd., Yeovil. The Westland IV, in which he took a flight, is shown in the background. Left to right, Mr. E. M. Benjamin, Capt. Paget, Mr. P. W. Petter (Managing Director of Petters, Ltd.), His Excellency Sheikh Hafidh Wahba, Mr. All Shukry Bey, Mr. T. D. Cree, Capt. R. C. Petter, Capt. Hill, Mr. R. J. Norton. THE R.A.F. AT WESTLANDS: A group of officers from Henlow who we re shown the home of the Wapiti and Westland IV recently. Flt.-Lt. Paget and F/O Brunton, who are test pilots to the Westland Aircraft Co., are on the right hand edge and third from the right of the photo. FOREIGN GUESTS AT A BRITISH CHRISTENING: Sir Sefton Brancker, Director of Civil Aviation, surrounded by Air Attaches, standing in front of the Westland IV monoplane. Imperial Airways’ Cirrus Hermes-engined Westland IV at Croydon. THE WESTLAND IV: A small three-engined monoplane first used in 1929 for special charter work. The Westland Stand nearly defied our photographer, as no viewpoint could be found which would show the limousine, the "Wapiti" and the "Widgeon." Cobham's Westland IV after being fitted with five-cylinder Genet Majors, seen on the golf course at St Mary’s, Scilly, in 1936. 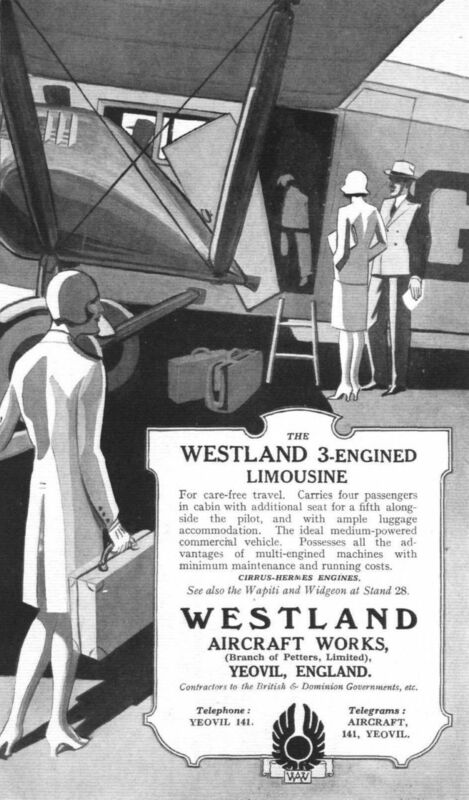 THE WESTLAND "WESSEX ": A new version of the Westland IV Limousine, a six-seater commercial cabin monoplane fitted with three Armstrong-Siddeley "Genet-Majors." Four of these machines have been ordered by "Sabena," the premier air line operating in Belgium and the Belgian Congo. 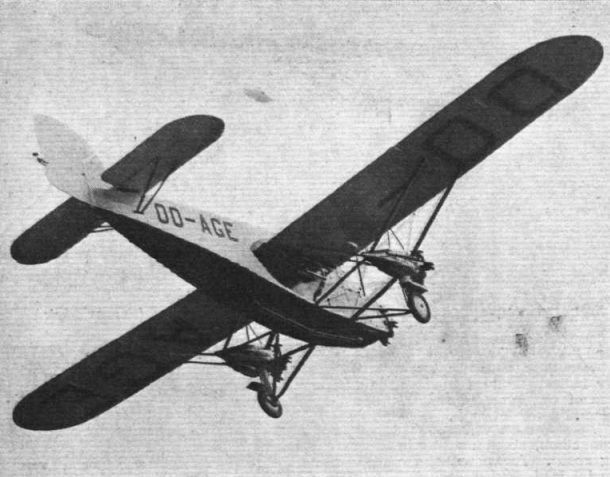 On July 2, M. Cocquyt, of "Sabena," took delivery of the first machine, and before flying it to Belgium he made a series of test flights, with which he expressed himself extremely satisfied. Incidentally, the marking "P-" is the "trade" number allotted to the Westland Aircraft Works for aircraft which have not yet received their full registration letters. 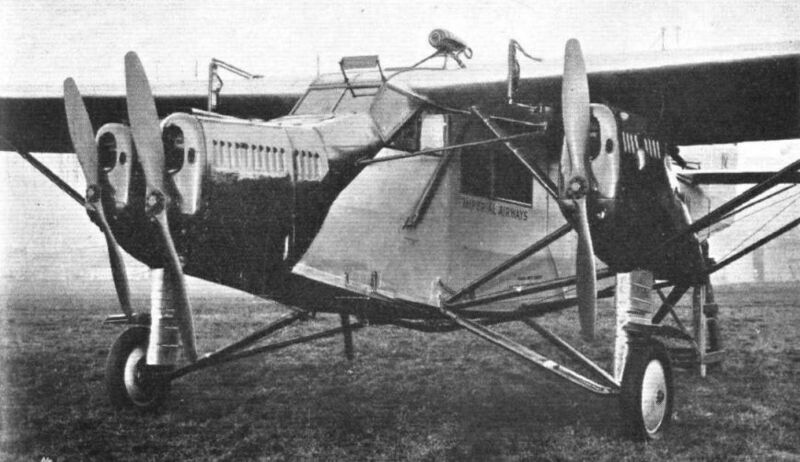 Westland Wessex built for Belgian air lines. The prototype Wessex, and first of four for Sabena. The Westland "Wessex" in flight, photographed from another Westland Aeroplane. The Westland "Wessex" (three Genet Majors) which came over from Yeovil. An unusual view: The Westland "Wessex" from below. 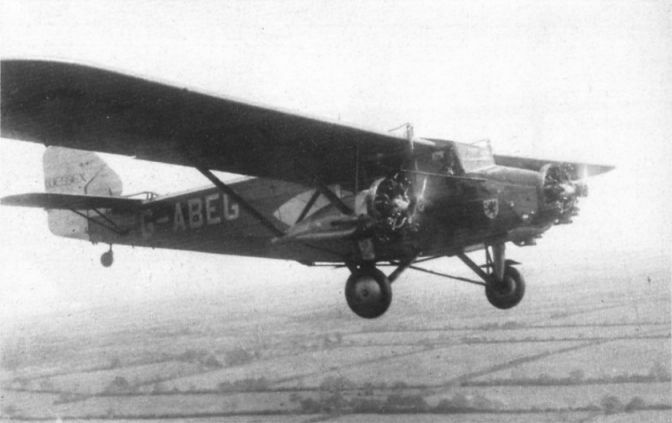 The tri-motor Westland Wessex OO-AGE which later became G-ADEW. The Westland Wessex G-ABEG was used by the Prince of Wales for a trip to the French Riviera in 1931. 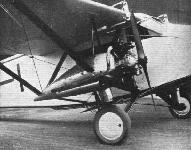 The aircraft was powered by three seven-cylinder 140 h.p. Genet Major IA engines. 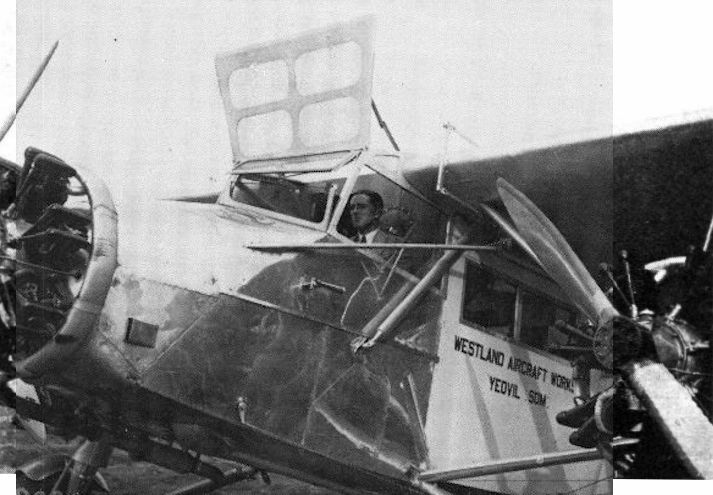 The Westland "Wessex" six-seater cabin monoplane, fitted with three Armstrong Siddeley "Genet Major" engines, which has just completed a 6,000 miles tour of the British Isles. The Westland "Wessex" in which the Prince of Wales flew back to London from Plymouth, piloted by Fl.-Lt. E. H. Fielden. The Westland "Wessex" Limousine used by Mr. Harold Peake for canal survey work in the East Midlands. The Westland "Wessex" (three 7-cylinder Genet Majors) which carried some of the Mayor's party from Heston to Romford. The high-performance Wessex G-ABEG with seven-cylinder Genet Major IAs. The high-performance Wessex delivered to Imperial Airways in 1933. Imperial Airways’ Westland IV at Croydon after conversion to high-performance Wessex. Even when enclosed flight decks were accepted, however, there was a reluctance to abandon the open cockpit completely. In the Westland Wessex, for example, the windscreen could be opened to improve forward vision in fog or rain, and the entire cockpit roof opened upwards for emergency escape. 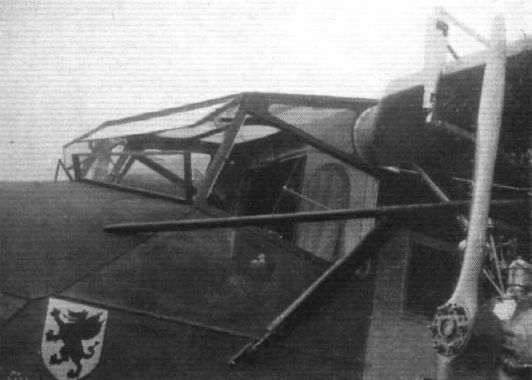 Excellent visibility is provided in the cockpit of the Westland Wessex, and the front windscreen now opens both in the front and at the side for use in bad weather. The latest model, with three 7-cylinder Genet engines, has a fine performance, and a recent flight in it with one engine stopped was a revelation. PSIoWA’s special Wessex, with raised crew compartment and modified tail unit, at Portsmouth, with Jersey Airways' D. H. Dragon G-ACMO St Ouen’s Bay on the right. 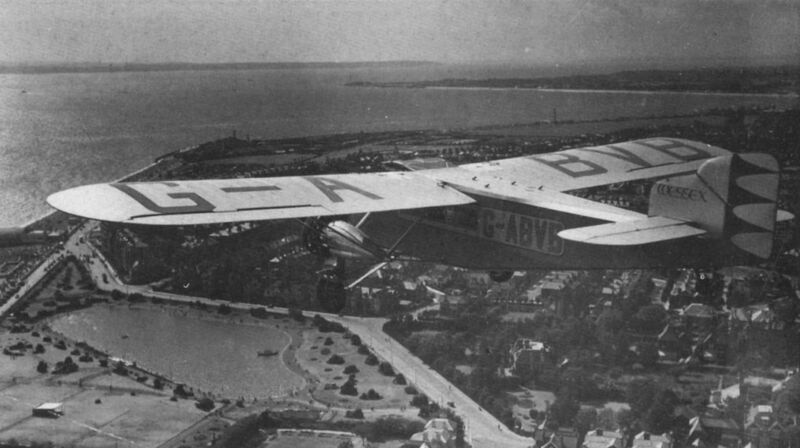 FOR THE ISLE OF WIGHT SERVICE: A Westland "Wessex" (three Armstrong-Siddeley "Genet Majors") recently delivered to the Portsmouth, Southsea and Isle of Wight Aviation, Ltd.
PSIoWA's Wessex G-ABVB over Southsea en route to the Isle of Wight in the distance. This view shows that there is no difficulty in flying the "Wessex" with one of the engines stopped. Actually we made a circuit of Heston Airport like this, climbing at quite a fast rate after the photograph had been taken. 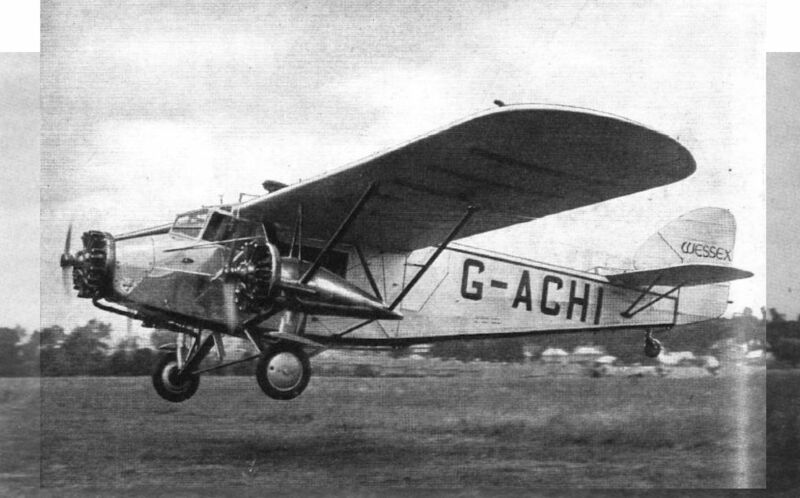 Believed to be the last Wessex, G-ACIJ, with cowled engines, before delivery to Egypt. WESTLAND WESSEX FOR EGYPT: A Westland Wessex, with accommodation for six passengers and pilot and navigator, has just been supplied by the Westland Aircraft Works to the Egyptian Army Air Force for transporting high officials in Egypt. The machine was submitted for acceptance tests at Heston and the guaranteed figures comfortably attained. On March 15 the machine set out for Egypt, the trip being made via Paris, Marseilles, Nice, Cagliari, Sardinia, Tunis, Tripoli, Cairo. Taking it in easy stages the machine arrived at Cairo on March 21. The pilot was Mr. D. P. Cameron, who has made this trip several times before. 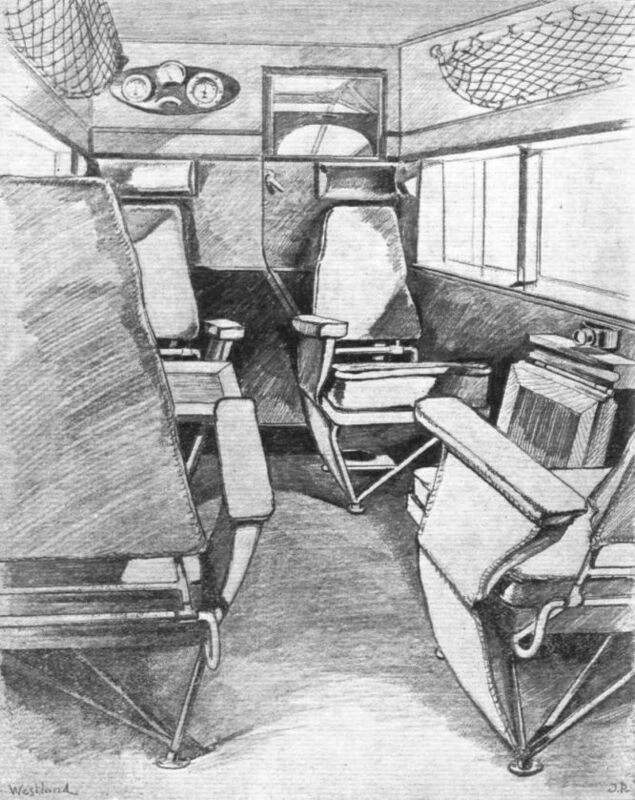 FOR FEEDER LINES: This side view of the eight-seater Westland "Wessex" (three Armstrong-Siddeley "Genets") emphasises the fact that the passengers can see out of the cabin through large well-placed windows and that the wing engines impede their view but little. 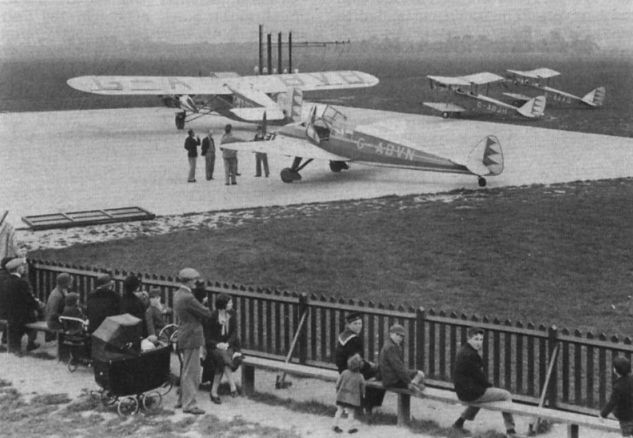 Imperial Airways’ charter fleet line-up at Croydon in 1933. Right to left: Westland Wessex G-ACHI and G-AAGW, Avro Ten G-ABLU Apollo, and Desoutter I ambulance G-ABMW Air Taxi No.6. A group of onlookers gaze at part of the PSIOW fleet at Portsmouth in 1937. The Westland Wessex G-ARVB was specially built for the airline’s high density routes, and metal tubing replaced the wooden members in the wings. The General Aircraft Monospar ST-4 survived in Australia until 1954, but D.H.60 G-AAAG crashed into the Solent on November 1, 1934, after a low level stall, the two occupants being drowned. No steps required: The door of the Westland "Wessex" is low over the ground, and passengers step straight in. 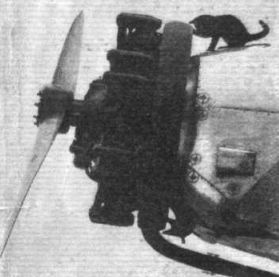 THE GROUND ENGINEER: Croydon Aerodrome's pet cat inspects the Armstrong-Siddeley "Genet" on an Imperial Airways Westland "Wessex." No doubt it would have preferred a "Lynx" or one of the other cat tribes. Mounting etc. of the starboard "Genet Major" in the Westland "Wessex." IN COURSE OF CONSTRUCTION: This photograph of the fuselage of the "Wessex" gives a good idea of the structure, and also shows one of the outrigger mountings for the outboard engines. IN the cabin of the "Westland IV" - three-engined limousine some of the passengers face forward and some aft. A door in the forward wall gives access to the pilot's cockpit. 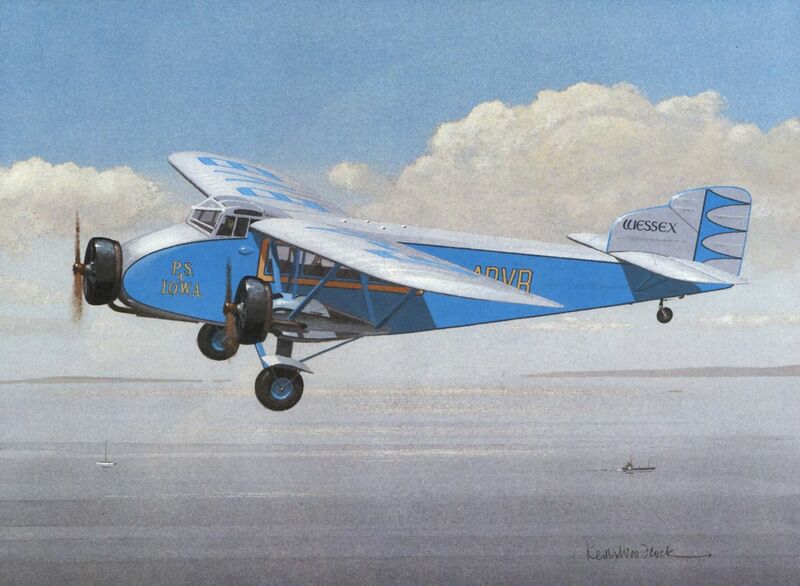 KEITH WOODCOCK'S painting shows Portsmouth, Southsea and Isle of Wight Aviation's special Wessex G-ABVB. 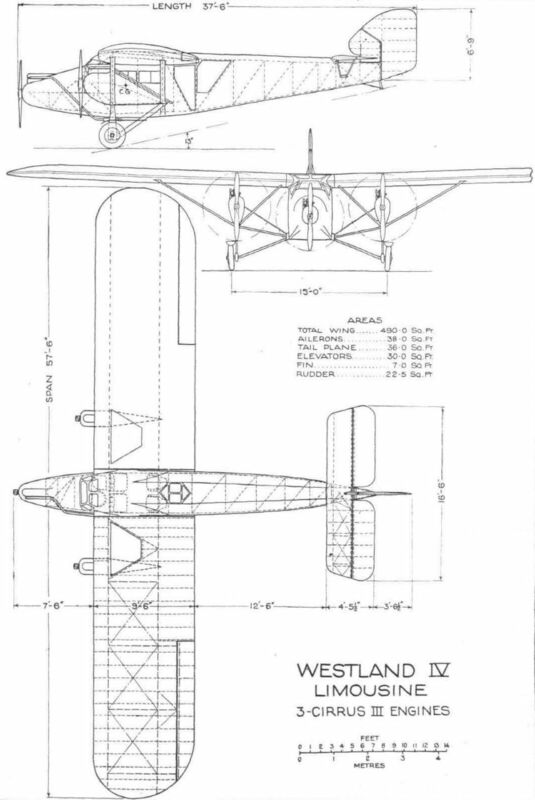 Westland 1929 drawing of the Westland V project. 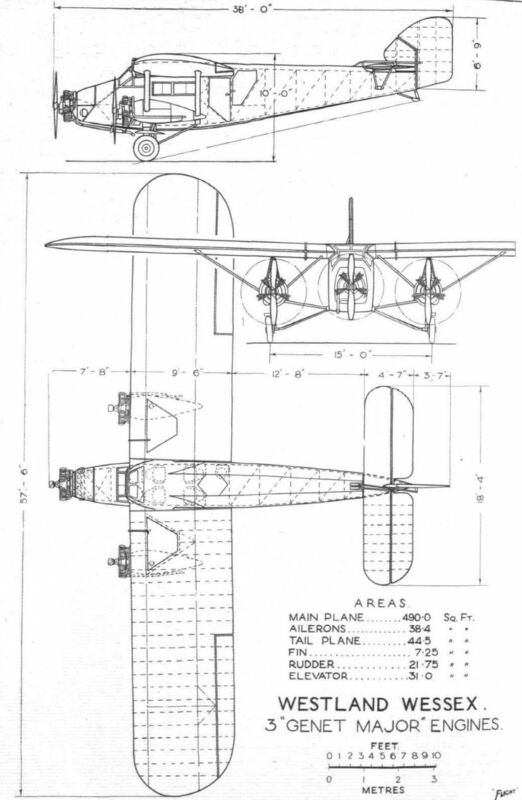 THE WESTLAND IV MONOPLANE: Diagrammatic Perspective sketch, showing mounting of starboard wing engine. On the Westland Limousine the rear fuselage portion is of square tube construction. Rubber buffers are used in the suspension of the petrol tank in the wing.